Skywatchers throughout the Northern Hemisphere report the newly visible Comet Holmes is a remarkable sight even under city lights. The comet, described in glowing terms by many observers, should continue to be visible to the naked eye for at least the next few weeks. Only a couple comets each decade are this easy to see. Holmes is actually an old comet. First seen in November 1892 by British observer Edwin Holmes, it has since made 16 circuits around the Sun and should have fizzled out a long time ago. It made its closest approach to the Sun last May, yet never came closer to it than 191 million miles (307 million kilometers). The comet is actually moving away from the sun now, almost midway between the orbits of Mars and Jupiter. Not exactly a recipe for an outbust, since solar heating is typically what triggers comets to brighten. But sometime late last Tuesday, Oct. 23, this comet underwent an explosive outburst and within just 24-hours increased its brightness almost a million-fold. Since then, Holmes has been putting on a unique display, looking very different than any other comet of our generation: It has yet to sprout a noticeable tail, while its head—called the coma—appears like a round, yellowish fuzz ball in the constellation Perseus, and is visible for most of the night. You can find Comet Holmes by using the "W" of Cassiopeia as your guide [map]. The five stars in a conspicuous zigzag pattern are high in the northeast sky during the mid-evening hours. Draw an imaginary line from the star Gamma Cass down to Delta Cass (known also as Ruchbah). Extend the line downward about five times the distance between these two stars and you'll come very close to where Comet Holmes is. 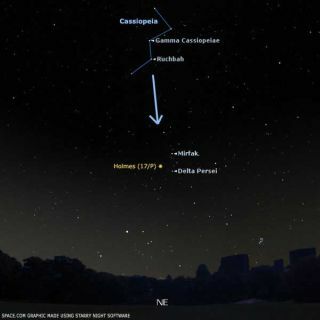 The comet itself forms a triangle with Alpha Persei (known also as "Mirfak") and Delta Persei. If you have binoculars, you'll know the comet immediately when you see it: a small, albeit distinct, circular lemon-yellow cloud of light. A small telescope will help bring out the fuzzy details. The moon, which was full on Oct. 26 and whose brilliant light hindered comet viewing to a degree, is now diminishing in phase and rising later in the night, allowing viewers an increasing window of dark sky before the moon interferes. The moon is one day before last quarter on Oct. 31 and rises just after 11 p.m. (daylight time). But by Nov. 4, it will be rising around 1:20 a.m. (standard time), having shrunk to a crescent, and leaving more than half of the night dark for comet watchers. Long Island, NY amateur, Bryan Bradley writes: "I went out the past two nights and observed the comet from my driveway observatory. Very interesting how bright it has become. My daughters also saw it with me and commented that it looked like a big fuzzy ball, but where is the tail?" Percy Mui photographed the comet from Illinois, capturing the fuzzball appearance reported by many. Another Long Island amateur observer, Rich Tyson relates that "My wife Antoinette described Comet Holmes as looking like a "fried egg." Can we call it the 'Fried Egg Comet?'" Well-known comet observer John Bortle, of Stormville, NY, has carefully scrutinized the comet on a number of nights with a variety of different instruments. He saw the comet on the evening of Oct. 28 without the glaring Moon in the sky. "So much info was recorded I can't begin to report more than a fragment of it here. A double envelope feature surrounding the comet is truly spectacular in the darker sky." Similar raves were coming in from other places around the globe. Eddie Guscott from Essex, England had been trying to see Comet Holmes since it exploded into view, but " . . . the weather here has been dire: 100-percent cloud. So it was a great surprise to finally get an hour of clear weather enabling me to observe this wonderful sight. I have never seen anything like it before." "The comet was a surprisingly easy naked eye object despite the near-full moon sitting above it," McNaught said of comet Holmes. "Lovely views in the Uppsala's 6-inch finderscope at 80x showing the faint stellar condensation and 'an' within the large 'planetary nebula'-like coma. Very impressive." More than a week after Comet Holmes erupted, astronomers are still debating what caused it. Some think it might be due to a rich vein of volatile ices on the comet's nucleus that was suddenly exposed to sunlight. This is actually the second time that Holmes has flared up in this manner, the last time coming in its discovery year of 1892. Bortle suggested the nucleus of Comet Holmes might consist of low-density material that, over time and through outgassing, develops a large region with a very tenuous structure, perhaps honeycomb-like. The show could have a reprise later this year. "Those who are familiar with terrestrial structural collapse situations are aware that the primary event often leaves a large amount of instability in the material involved," Bortle said. "This remaining instability will only remain for a short time before a further adjustment toward stability occurs, resulting in a major second collapse, with an outward physical appearance very similar to that of the initial event." Back in 1892, Comet Holmes underwent a second outburst about 75-days after the first. Will there be a "cosmic aftershock" that will again cause the comet's brightness to again spike a similar number of days after the big Oct. 23 outburst this year? Bortle thinks it's a possibility. "I would urge everyone to watch very carefully for a possible repeat of this secondary event about the turn of the year," he said.